Pike's Place: Oh Just Kilt Me Already! Kilts, in the traditional sense are supposed to be worn "commando", and although they are quite comfortable worn in this manner and provide good "air conditioning" its not exactly why I'm wearing one. Due to the illness, and the restricted movements of my arms I started finding it very difficult to go to the washroom on my own. Getting my pants and underwear off was not that big deal (it has become more challenging), but afterwards it's become nearly impossible to put them back on. For months, I would have to shuffle into my room in various states of disrobe, lie down on my bed and perform all sorts of gymnastics to get my pants & underwear back up. Then of course came the chore of doing them back up. Of course, if you see my previous post about my status you will no doubt have noticed that I rate the function of my hands and arms in around 15% right now. Because of this, and the fact that I spend large portions of the day on my own, I needed to find a solution that provided a better "access" to prevent "accidents". So far the kilts solution is working out reasonably well. Much easier than dealing with pants and underwear. But the key to this is of course wearing them "commando". It's also for this reason, I wear them around the house only, kind of like pajamas. They are not intended to leave the house. Sorry folks, a little bit more in the graphic details in this paragraph… Going to the washroom now is much easier. Especially to go pee. Because of the dexterity problems I do have to sit to urinate, this eliminates "accuracy problems". The kilt is very easy to keep out of the way when sitting. However, when I have to "drop the kids off at the pool" its a bit more challenging to make sure the kilt is out of the way. But with a little bit of effort, it is much more manageable then dealing with pants and underwear afterwards. So far I've not had any "misses". So where do I get mine? I'm wearing a deluxe utility kilt purchased from http://www.utkilts.com/. Not the traditional wool type. 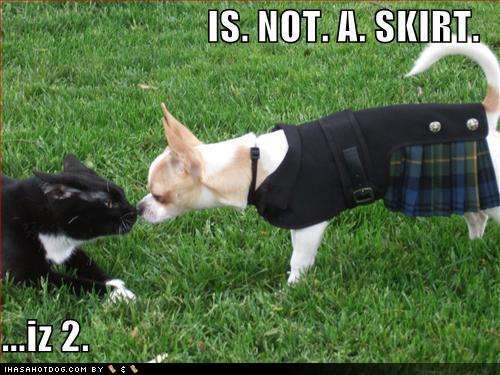 A traditional wool kilts would be far too heavy and unmanageable (I used to have one for Halloween costume). The utility kilt is great and has some really cool cargo pockets on either side. There are surprisingly accessible and very easy for me to keep my cell phone in. They come in a variety of designs and colors and are fairly reasonably priced. Before finding this website, I actually ordered mine from eBay from this company. Consequently I ended up paying a little more than I otherwise would have. If you order directly from http://www.utkilts.com/ it works out to be a little less expensive, saving you about $15. The kilts are shipped by the pound, with a minimum shipping cost of about $30. 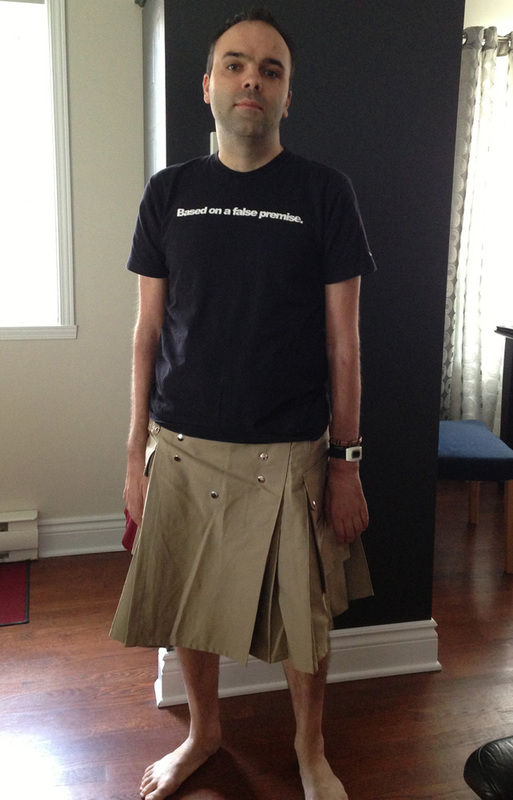 But adding more than one kills only adds about six dollars to the shipping cost, so if you are serious about wearing a kilt ordering more than one might be in your interest. As a matter of fact as soon as their stock is back in, I am going to be ordering two more deluxe utility kilts.